In the same segment Sebastianite Anusha Perera who was placed third last week took the second place polling 4,907 votes. There was a big change in the ‘Gold’ competition for Division II schools when Yamal Siriwardena of St. John’s College, Nugegoda took the third place after being placed at Number 6 last week with 2,991 votes. 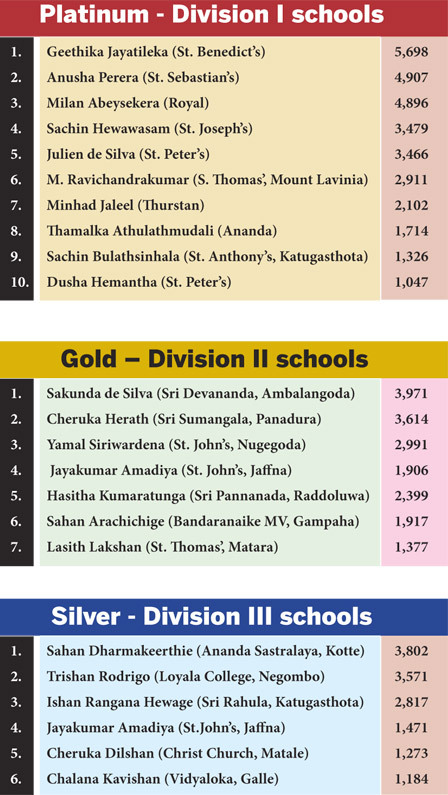 In the ‘Silver’ competition for Division III schools, there was one change with Sahan Dharmakeerthie of Ananda Sastralaya, Kotte taking the number one slot pushing Trishan Rodrigo of Loyala College, Negombo to second place.